Virgin Mary. Combine low-salt vegetable juice with a squeeze of lemon juice, a shake of pepper, a dash of celery seed, and a splash of Worcestershire and/or Tabasco sauce. Serve over ice with a stalk of celery. Party punch. Mix equal amounts of orange juice, pineapple juice, and seltzer. Garnish with a slice of orange or fresh pineapple. Margarita. Combine orange juice, a splash of fresh lime juice, and a sprinkle of margarita mix. Piña colada. 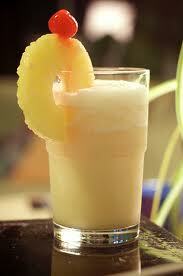 Blend 1 part coconut cream with 3 parts pineapple juice and crushed ice. Strawberry daiquirí. Blend fresh or frozen strawberries with a splash of lime juice and crushed ice. Tahitian punch. Blend fresh strawberries, papaya, banana, and pineapple with orange juice and seltzer. Mimosa. Combine equal amounts of orange juice and seltzer. Next Next post: BBQ Time!! !